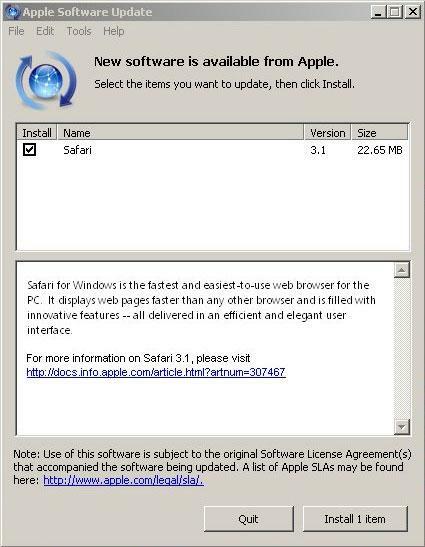 Windows users receiving the notification are greeted with Apple's marketing pitch alongside the download option, which reads: "Safari for Windows is the fastest and easiest-to-use web browser for the PC. It displays web pages faster than any other browser and is filled with innovative features —all delivered in an efficient and elegant user interface." Meanwhile, Apple is also contending on a second front in its charge towards supremacy in the browser market, to which it has witnessed more immediate success. Its iPhone and iPod touch —both of which ship with a mobile version of Safari —have served to springboard the company to the top of the US mobile browser rankings in a mere eight months, according a recent report from Ireland-based StatCounter.